Recording for A Series of Sneaks started in Austin during the spring of 1997. I was still living in Denton, Texas at the time, having just started playing with the guys only months earlier. I’d met Jim and Britt in Denton at the end of 1996 when my local band (Maxine’s Radiator!) opened for Spoon at a local venue, The Argo. Auditions and such followed and I was welcomed into the band. Recording for Sneaks began at Cedar Creek studio in Austin on a Neve console that Elvis used during the RCA years (!). John Croslin led as producer and we continued working on the record at numerous other studios in Austin throughout 1997. I played all sorts of basses (including my cherished Rickenbacker 4003 on “Car Radio”) and I played bass on all the tunes, except: “30 Gallon Tank” (no bass on it), “Chloroform” (is that bass?) and “Quincy Punk Episode” (recorded before my time with the band and Britt’s bass line is my favorite one on the whole album. seriously. it’s incredible). Getting a songwriting “credit” (where is that money?) for “Metal School” was great since it had the word metal in it. It was an absolute dream when Sneaks was released on Elektra in May 1998 but then they dropped us only months later. The rest is history. Ron Laffitte knows. 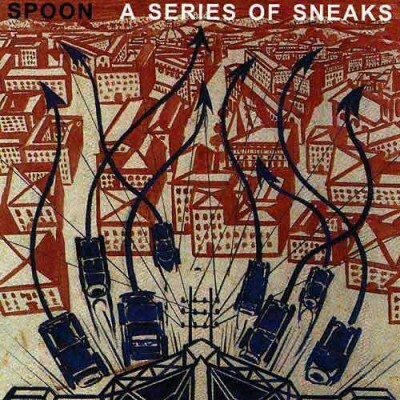 Sneaks has my favorite cover art of any Spoon release. Futurism rules!